Are you inspired by farmhouse DIY decor and would like to add some down-to-earth rustic wall art to your home? You are not alone as decorating your walls with free farmhouse printables trend is not going away (yet). Why is that? Why do we see #barndominiums on Instagram with a huge following of fans, numerous blog posts dedicated to all aspects of DIY farmhouse decor, as well as a pilgrimage of faithful fans to Waco, Texas which, thanks to the magic of Chip & Joanna Gaines of Magnolia Homes, became an unofficial capital of All-Things-Farmhouse? Home is the most important place on earth. It’s where life happens and where your family’s story is told. There is something heart-warming and nostalgic about simple things. Country posters or farm animals printables remind us about good food which is grown on a local farm or in your own garden (organically, of course), the warmth of a fireplace on a stormy day, a home filled with memories, laughter, and good times, and a feeling of belonging to a tight-knit community. That’s why farmhouse is not just a country decor style but a lifestyle that is appealing to so many people. Millenials are buying farms and growing organic vegetables as well as producing artisan cheeses. We see a come-back of a humane approach to raising chickens on pastures and collecting eggs that have all the goodness of sunshine in their yolks. Farmers’ markets are slowly making its way to the suburbs. And it feels great to add this warmth to your own home through farmhouse DIY decor, no matter where you live. One of the quickest ways to add farmhouse style and flavor to any interior is to decorate with free rustic wall art printables that you can download and print yourself or take to a local store. Any frame would work: you can repurpose some of your antique finds, buy simple black frames at IKEA, or upcycle pallet wood to make your own. Our team browsed hundreds of free and not-so-free printables and came up with a collection of BEST FREE FARMHOUSE PRINTABLES for home decor available. We checked all the sites for the authenticity of prints they are offering, evaluated the ease and quality of downloads, and made sure that all the links are current and working. Enjoy our Free Farmhouse Printables Round Up and if you find any discrepancy, please feel free to let us know and we’ll correct it. Let’s honestly face it: there is hardly any person who enjoys doing laundry. Consequently, it can become a chore that you keep avoiding for days… What if you can make your laundry room a delightful space and add some farmhouse-style black and white funny sayings that will lift your spirits? We have recently found a great collection of free laundry printables by The Mountain View Cottage that will greatly complement your modern farmhouse decor. Love the classic black and white theme! They can also bring a smile to your face when you are doing that tedious labor of love for your family. Print them today and enjoy! You can’t go wrong with this collection of classy and elegant botanical prints! Ready to be printed in 8″ x 10″ or 11″x 14″ formats, these unique vintage prints will create an impressive multi-panel rustic wall art collection that is sure to warm up your home. Use all 21 prints or create a triptych – it is your wall and you can decide how to arrange your art. The best part – it is FREE, thanks to SimplyMadeByRebecca! You can even use bigger frames and add some white or burlap matting if it suits better your existing rustic decor. Experiment and you will be rewarded by creating your own unique look. These tasteful rustic wall art prints are available from TheCottageMarket thanks to the generosity of author and creator Andrea. As each of these 2 designs is available with four different weathered wood backgrounds: white, gray, aqua, and warm-toned wood, they can go perfectly with any type of rustic farmhouse décor. These prints are available in 2 different sizes: 5”x7” and 8”x10” and with extra mating would create a wonderful gallery wall or a simple accent piece. Love the fonts and the beauty of a simple cotton wreath! The instructions are very clear and download is quick and easy. Just a delight! Are you fond of patent art but don’t know where to find an affordable print for your home decor? TheNavagePatch has a beautiful collection of high-quality patent art printables if you provide your email and sign up for VIP newsletter. Who doesn’t want the gorgeous tractor, cow milker, silo, and other farm animals printables designed with engineering precision and begging to be part of your modern farmhouse decor DIY style? You gain instant access to 18 free downloadable farmhouse patent art prints and other bonus farmhouse printables, so in our book, it is a win-win. They look great with an off-white, cream, and black background and will complement perfectly any farmhouse-style decor – just add an antique or DIY wooden frame. These alluring spring-fresh herb farmhouse printables created by CherishedBliss will brighten up your kitchen or dining room even if you don’t have farmhouse decor. They are simple yet charming and are available for no-gimmicks free download as PDF files. You can print them on regular 8.5″x 11″ paper and frame with mating (or without) for an eye-catching gallery wall. 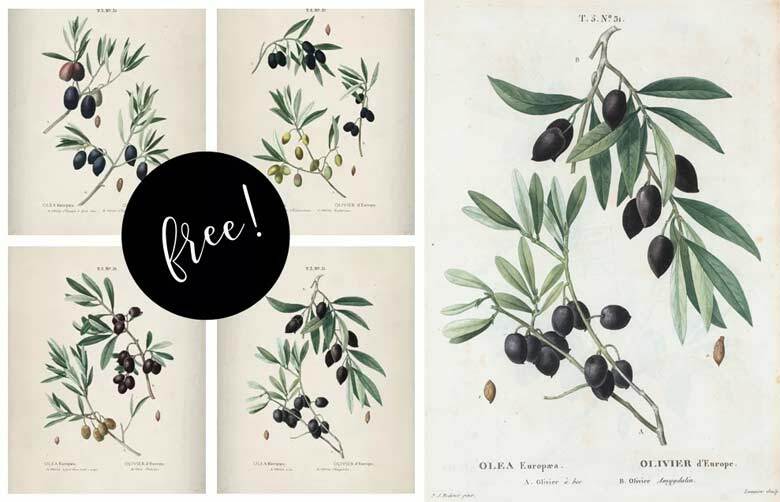 Six free botanical prints include Lavender, Rosemary, Thyme, Basil, Mint, and Dill. You can use all six of these charming herb prints or group them in 2 sets of triptychs. A gorgeous addition to your DIY home decor and it is FREE! These original watercolors were hand-painted by skillful artist Annie Mertlich and are available as a free download of Magnolia Journal content. Just click on the bottom link Spring Issue 2017 Download to save a zip file. There are easy step-by-step instructions on the page on how to unzip the files and get six wonderful ready-to-print vintage florals: allium, crocus, daffodil, hyacinth, muscari, and tulip. In one of our posts dedicated to three easy farmhouse decor projects, we shared a tutorial by Joanna on how to hang vintage printables. Check it out for the best of both worlds: free farmhouse printables and a DIY project you can do in an hour to add some farmhouse decor to your home. It is a quick and easy way to make your home cozy while staying on a budget with free printables. These high-quality Olive Branch botanical prints were shared by Lauren from Gather & Flourish and are an absolute delight! Available through New York Public library collection of rare books, they were lovingly cleaned and made available for an instant download if you subscribe to the blog. They come as a PDF file ready to be printed at home or on canvas (at your local UPS store, Costco, or any print shop) as multi-panel canvas prints and will make a great addition to the farmhouse style neutral decor. You can use them in your dining room or kitchen for a timeless display of olive tree botanicals with some vintage flair. Great find for those looking to spruce up home for spring with free farmhouse printables – all you have to do is find some frames that will complement modern farmhouse architecture. The next set is available from an inspiring blogger, talented graphic artist, and a busy mom who runs The Mountain View Cottage – Hailey Estes. If you are a farmhouse style enthusiast, you’ve probably come across her other work such as farmhouse butcher block animals and cute kitchen printables. The instructions for downloads are very clear and you get 50 wonderful farmhouse printables (12 Inspiring Bible verses for every month of the year and 38 planner free farmhouse printables to organize your whole life – from grocery list to weekly planner. If you are looking for free printable rustic wall art, this set is simply wonderful! Want to save them for later? Thank you for sharing!